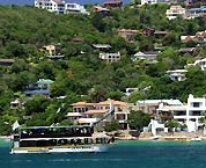 The John Benn is Knysna's only luxury pleasure cruiser. She is beautifully appointed with her upper and lower decks constructed from Yellowwood sourced from the Knysna Forest. 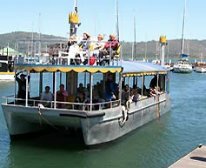 This unique vessel has carried many local and international travellers on the Lagoon over the years and offers daily cruises to the Knysna Heads. This legendary floating restaurant is for eating, drinking and having fun! The lunch time or sunset cruise aboard the John Benn is an experience not to be missed. Share the stories of the legendary pilot of a by-gone shipping era on a relaxing and comfortable trip to the Knysna Heads. This wonderful floating restaurant offers a wide dining selection from the a la carte menu, has a bar on each of the upper and lower decks and is fully enclosed. The John Benn is an ideal venue for corporate functions, staff parties and weddings, or simply to have a good time! If time is limited, join Three Legs for a 75-minute cruise with a difference! This Rivercat was featured on television's 'Beyond 2000' as one of the most advanced ferries ever built. 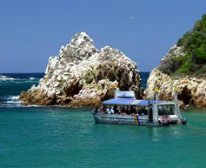 This is a fun and adventurous cruise to and INTO the Knysna Heads - weather conditions permitting - between the cliffs, visiting Otter Cove, Island Rock and passing the beachcomber caves. 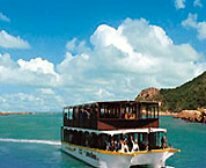 This unequalled experience takes visitors back in time to the days when Knysna was a port and shares with those on board the thrills and spills of Knysna and its past. Three Legs is an open ferry with a sun-deck or shaded seating. There are roll-down weather blinds, fold-away tables and cushioned seats. There is also a cash bar and snack menu on board.